The traditional staffing agency model is broken. Not only is it a relic from a time before a world optimized for technology, transparency and flexibility, but more often that not it is a model that requires a significant investment of time and resources for a result that is mediocre at best. BlueCrew changes the game by giving employers access to a platform of already interviewed and vetted W-2 workers available to quickly fill a wide variety of roles. BlueCrew’s proprietary “matching algorithm” makes sure the best qualified workers for a given role see those job opportunities first. In terms of speed, flexibility and control, it won’t surprise you to learn that BlueCrew’s technology runs circles around traditional staffing agencies, but let’s dig into the details. 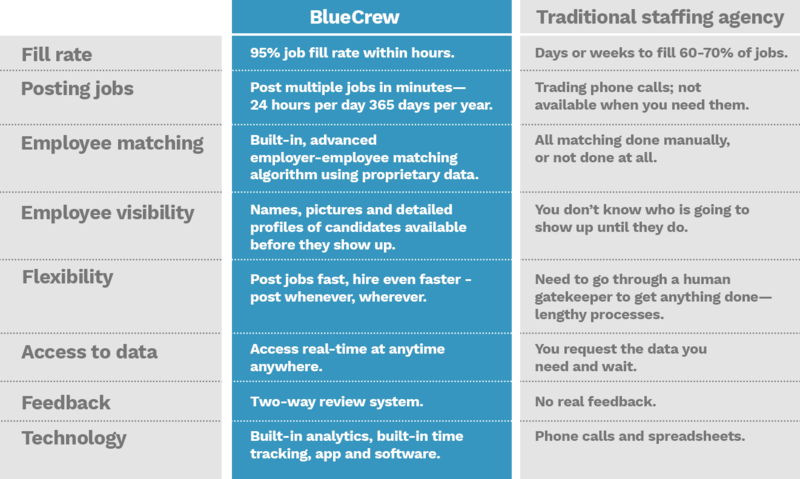 If you’re a visual person, check out our infographic that details the difference between the old staffing model and BlueCrew’s on-demand jobs platform. Unlike a traditional staffing agency that may take weeks to fill jobs since everything is done over the phone—BlueCrew has a 95% job fill rate, usually within hours. Our workers all have a face-to-face interview, are required to build out a detailed online profile, and go through a background check—meaning we are faster and have a more rigorous vetting process, so you get the highest quality workforce. By using technology to take out the middleman we find the right workers for the role weeks faster. Because we use our own data to make these connections we are more confident we’ll make a great match! Job posting for employers has never been this easy. Instead of calling a staffing agency representative to explain your needs, or waiting all weekend for your account manager to call you back, BlueCrew allows you to post multiple jobs in just a few clicks. If your needs change or you have special requirements you can easily customize your templates. While posting jobs and finding employees is incredibly easy on the platform, BlueCrew also takes the headache out of managing your workforce. Thanks to built-in, real-time data, employers who use BlueCrew can make informed decisions whenever (our website is available 24/7, 365 days a year—not like a rep at a staffing agency) wherever (desktop or mobile), scaling up when things are going well, or adjusting to seasonal changes. No more putting in requests for data. No more waiting. It’s all at your fingertips, keeping you in control. All workers have profiles, pictures, ratings and a list of their previous experiences in a standardized format. BlueCrew also has a great built-in feedback loop with a two-way review system. Employers can review workers—which helps our algorithms figure out who the best people for the job and company are—and workers can review employers, providing insight into what it’s like to work at a company for other people considering a position. No abuse is tolerated in the review system, ensuring it is fair to both parties. Review and rating information also helps us work with our employers to identify any morale or management issues early. At BlueCrew we take good customer service and top-notch account management seriously. It’s something we’ve built into our company values. While this isn’t necessarily a “differentiator” it is something you won’t have to worry about losing when you switch from your staffing agency to BlueCrew. The traditional staffing agency model is cumbersome, unreliable and not transparent. Most staffing agencies require a lot of phone calls, paperwork and manual dispatch that is at best slow, but also has a high rate of error. This all leads to low fill rates. There’s also no feedback loop and little insight into candidates and blurred lines of communication. By contrast, BlueCrew provides an online platform that allows for rapid, on-demand hiring while still keeping real people in the loop—every market has a dedicated local team that meets every candidate, vets their skills and is available to support your business. BlueCrew’s all-in-one solution keeps the employer in control of hiring decisions and does all the hard work involved in recruiting, screening, onboarding and managing payroll. To top it all off, accessible, real-time data is available at the click of a button. While other on-demand staffing platforms offer workers and employers flexibility and control, BlueCrew also offers reliable W-2 work, which results in a higher quality workforce using our platform. The advantage of choosing BlueCrew for your hiring needs over other “gig work” platforms is that our workers are looking for more full time work at a company that fits them. Not only is our platform built to offer workers reliable and flexible work, but it is designed to give employers more control over the whole hiring process. Employers can put in requests for specific candidates, or have job listings sent first to those who’ve done a great job working for them historically. By this same token, employees can request a specific worker not return—for whatever reason. BlueCrew’s algorithm takes all this data into account next time it comes around to matching employers and employees. The amount of control given to both parties creates a system that is fair and that offers flexibility and sustainability. Furthermore, these jobs are filled by local and experienced W-2 candidates who have had a face-to-face interview, been pre-vetted and background checked and who are ready to work immediately. Employers can take comfort in knowing we’ve met every employee on our platform. At BlueCrew, we consider our workers a part of our team and we give them the full benefits of a W-2 employee. Other gig platforms suggest there is a choice to be made between flexibility and W-2 protections—we know that’s not true, and our workers and employers get both! From the worker’s perspective, the BlueCrew platform is a major step up from mobile-first alternatives. Where other on-demand job platforms offer flexible jobs and an opportunity to craft a schedule that “fits your unique lifestyle,” none of them also offer overtime, sick pay, minimum wage and workers’ compensation (some of them even have the audacity to ask you to pay extra for these benefits!). At BlueCrew all workers are given these protections no matter what. Workers love BlueCrew even more when it comes time to file taxes—not only are there no surprises because a portion of taxes have automatically been withheld during the year, but they also pay a lower tax rate and are eligible for the earned income tax credit. From an employer’s perspective, our customers know that providing workers the protections they’re entitled to is not just the right thing to do, but the prudent thing—there is, after all, significant legal and tax liability to misclassifying workers as 1099 instead of W-2. BlueCrew’s Points and Promo structure rewards positive behaviors and is a great way for workers to create a resume that stands out from the crowd, that highlights proficiency and diligence, and that rewards a job well done. For employers it’s also a good indicator of a candidate’s character, dedication to the job and desire for career growth on the platform. Every shift contributes points to an employee’s profile as does getting “favorited” by a company and earning a high rating on a job. These points can then be redeemed in the form of career advancement (free forklift training, for example). By this same token, cancellations, late arrivals and low ratings result in deductions of employee points. In this way it is easy for employers to get a real pulse on who they are hiring. In comparison to other on-demand job platforms, BlueCrew puts a focus on hiring for quality. This is why we take the time to prescreen workers, conduct thorough background checks and meet with them face-to-face all before their first job with BlueCrew. In classifying workers with W-2 status, we safeguard employers against liability concerns and make life easier come tax time for our workers. As a whole our on-demand platform allows employers to hire fast, to hire vetted workers and to manage those workers via intuitive in-built dashboards, unique to BlueCrew, and packed with actionable data and insights. Hire for flexibility and reliability with BlueCrew’s platform of prescreened W-2 workers ready to work immediately.